SAP Crystal Dashboard Design Departmental Edition with DataConnect Express will allow you to create more interactive dashboards. With up to 50 queries to live data, you can use complex functions like drill down and what if scenarios. This will allow you to analyse your data more quickly and efficiently, easily spotting trends and maximising the effectiveness of your business. Whilst extremely feature rich and ideal for many small businesses, this product is limited in terms of number of queries and users. DataConnect Express will allow users to build web services in a fraction of the time utilising the intuitive drag and drop interface but the number of queries is limited to 50. The number of queries dictates the complexity of the live dashboards; 50 queries should be ideal for approximately five simplistic dashboards or one or two very complex dashboards. This product is also limited to a maximum of five named users within any organisation, making it ideal for smaller businesses, C-level executives, proof of concepts, or departmental use. SAP Crystal Dashboard Design Departmental Edition with DataConnect Express is licensed on a named user basis, with a limit of five named users per organisation. Every dashboard user will require a licence to view dashboards. If you require more flexible licensing including concurrent session licences, allowing users to share licences, these are available with Flynet Xcelsius Server. Flynet recommends Microsoft Windows 7 and Server 2008 R2. 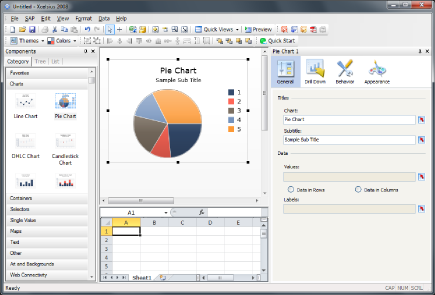 Microsoft Excel XP, 2003 - 2010 for dashboard development. 10 gigabytes or more of free hard disk space. Flynet Xcelsius Server is also compatible with Microsoft Windows XP, Vista, Server 2003 R2 and Server 2008. 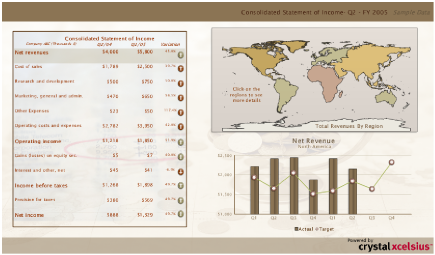 SAP Dashboard Design / Xcelsius requires Adobe Flash and Microsoft Excel 2003 - 2010. Flynet Xcelsius 2012 allows you to connect to unlimited web services, so users can create meaningful dashboards with multiple drill downs. All other SQL based ODBC and OLEDB compliant data sources are compatable in 'free text mode', where you can type your own SQL, which DataConnect will then convert to a web service. DataConnect allows you to manage your connections and store them in a central location, this minimises the workload as dashboard developers can reuse connections that their colleagues have created to access the same data.